Made from lemons, water and salt. Smells like old-fashioned lemonade, fresh and clean. Most appealing. Lovely bright lemon colour, unblemished lemon rind. Liquid as thin as water and very clear. Flesh hard to dislodge from rind, rind tender but with some bite to it. Initially very salty and it burns the mouth a bit, but then the saltiness dissipates and the flavour opens up to an intense lemony taste which lingers and lingers. Some bitterness present, but not overpowering. Comments: I’d recommend giving the rind a brief soak in cold water before using, unless you are adding it to a dish that requires good salting (in which case, don’t add any salt to the dish until you taste it). With this brand you get the most intense lingering lemon flavour of all the products I tried (actually, one small piece of lemon rind flavoured my mouth and breath for 30 minutes). A disadvantage is the short life once the jar is opened (although the jar is smaller than most other brands so you might whizz through it). The product recommendation is to refrigerate once opened and use within 10 days. However, I’ve kept an opened jar longer than that and survived after eating the contents! Made from lemons and salt with flavourings of pepper, bay leaf and cinnamon stick. The product is made with whole lemons, cut through the stalk end to within .5cm so the lemons stay intact. Good fresh lemon smell though more subtle than the Sandhurst brand. Preserving liquid is thickish and glossy. Flesh dislodges easily and cleanly from the rind. The lemons are salty, but the salt dissipates quickly, and some sweet lemony notes come in. The salt washes around the mouth giving an immediate lovely mouth-filling lemony-ness. There’s no bitterness with this product. A good texture, there’s no mushiness, tender with a little crunch. Leaves a pleasant lingering lemony freshness in the mouth. Comments: This would be the classiest product I sampled (whole lemons prepared this way look really attractive), and one I have used for many years. Product recommendation is to refrigerate once opened where the lemons will last for many weeks, if not months, but don’t stick them at the back of the fridge and forget them. They’re too good for that. I picked up two varieties of Julie Le Clerc Preserved Lemons, one made from Meyer lemons (the first entry listed below) and the other from a pale yellow-skinned lemon, possibly YenBen or Eureka, or something similar. Made from lemons (Meyer), sea salt and water with flavourings of bay leaf and peppercorns. Slight fermented smell of over-ripe lemons, bit musty (bay leaf, most likely). Orangey-yellow skin, typical of Meyer lemons, cut into large wedges. Lots of pips. Very little liquid in the jar and what there is, is thick and gloopy. Flesh is easy to dislodge from rind and the rind has great texture with a slight crunch. Big round lemony flavour, quite tangy, like lemon juice. The salt is integrated and not aggressive. There’s no bitterness. 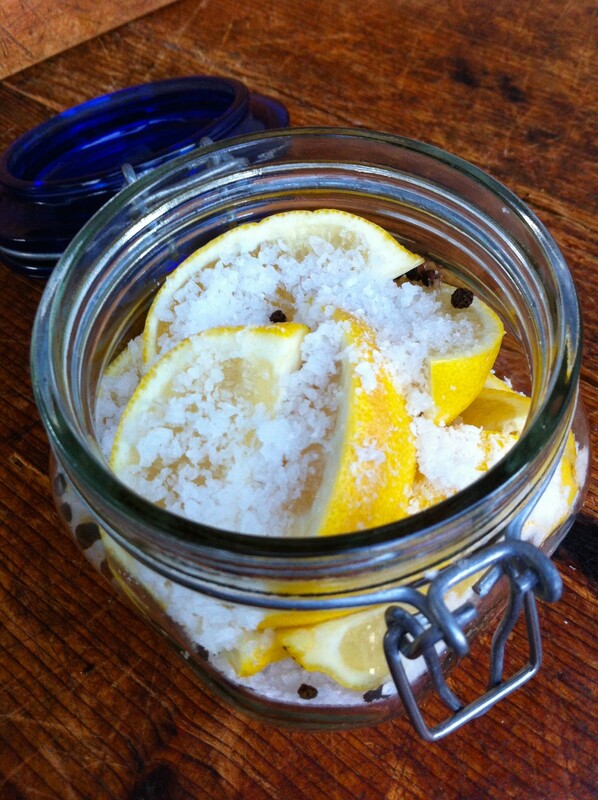 Made from lemons (lemon-coloured lemons), sea salt and water with flavourings of bay leaf and peppercorns. The rind is a dull yellow in colour, blemished in parts. The preserving liquid has solidified. Flesh easy to dislodge from rind. The product is salty but not aggressive, with hints of fermented lemon rind, but overall a good rounded lemon flavour. No bitterness. Comments: The chunky cut and pips in the Meyer lemon version give this product a homemade look. Information on the jar tells us ‘Small batch production’. There is a suggestion on the jar to incorporate 1 tablespoon of the lemon syrup into salad dressings or meat marinades, which could be a good idea, but the syrup in the jar of the yellow preserved lemons had turned to a stretchy jelly (the syrup in the jar of preserved Meyer lemons was thick and gloopy but useable). Overall the product is well balanced in flavour, leaving a savoury lemony taste in the mouth. Made from lemons, water and salt with flavourings of smoked paprika, herbs & spices. Medicinal smell, notably star anise and bay overtones with faint fermented lemon rind. Bright yellow-orange lemons (Meyer), cut into halves or wedges, not uniform. The liquid has taken up some of the colour from the spices and tiny dots of paprika are visible. These lemons have a really hot bite. The chilli attacks the taste buds, drilling in, then moves to the back of the throat. The spices bring in top notes of bay and cloves; they’re almost floral and carnation-like. Salty, but not excessively so, but hardly lemony, apart from the initial burst, and a final kick-in once the chilli has cleared. The rind has a pleasant soft crunch texture. Comments: I found whole red chilli, star anise, bay leaf and whole clove in the product and this combination probably accounts for the medicinal aroma of the product. This is not what you expect in ‘preserved lemons’ but that’s not to say it’s not a great product. I think it would shine in a cooked dish where you want heat, salt, spice and lemony top notes. Made from lemons and salt. Fresh lemon-lemonade smell, clean and inviting. The pale lemon coloured skin is unblemished, even toned and cut into thick wedges. The flesh is reluctant to part from the rind. The liquid is thickish and glossy but not gloopy. 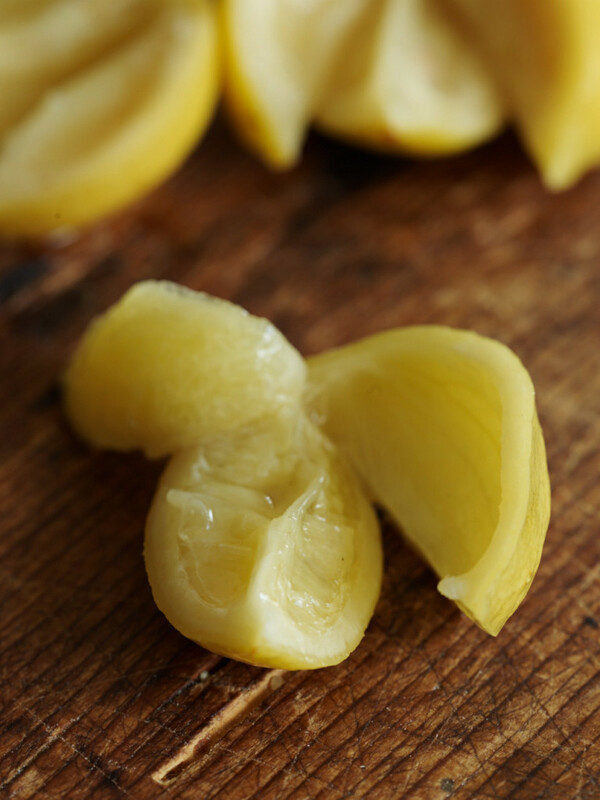 Bitterness is prominent to begin, then a powerful lemon rind taste fills the mouth – slightly oily, the absolute essence of lemon rind. It lingers several minutes, then leaves the mouth fresh with slight bitter-lemon rind residue. The product is not overtly salty. Comments: I’ve used this product for many years, and I noticed this summer for the first time that Meyer lemons were being used. This is the only product to acknowledge a seasonal variation on the jar, ‘Seasonal fruit variations may occur’. (The stock currently on sale is made with pale-skinned lemons.) These lemon wedges have a high proportion of white pith which probably accounts for the bitterness; the product I tried in summer made from Meyer lemons was sweeter. This brand is the most uncomplicated of all I tried, just lemons and salt.